The KB Box brings lightness and colour into the office. 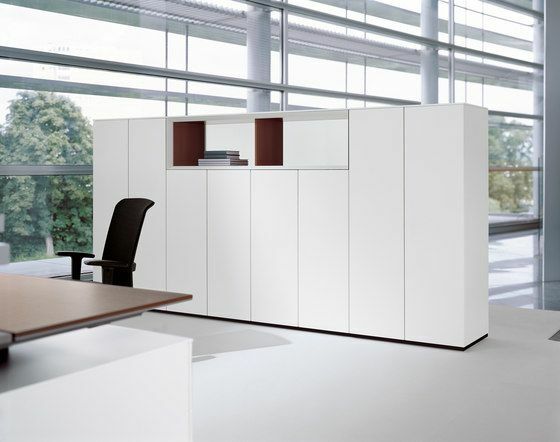 As an additional storage element, it structures the space and provides communicative views across the workplace. Both eye-catching and a practical storage solution, the KB Box has a distinctive slanted edge design feature. A large variety of colours and materials enlivens the space and provides friendly accents across the office landscape. The KB Box is connected either directly to the cabinets (on top or integrated), attached to a skid base, suspended from the wall, or semi-mounted on the cabinet as an upright table. The storage element is available as an open element, with a back piece made of translucent perspex, or completely covered with sliding doors. Flexible dimensions for individual designs. Compatible with Bene cabinets and system walls.